Bartt teaches you ukulele basics, plus more advanced techniques. His famous sense of humor and renowned teaching style will get you strumming like royalty! 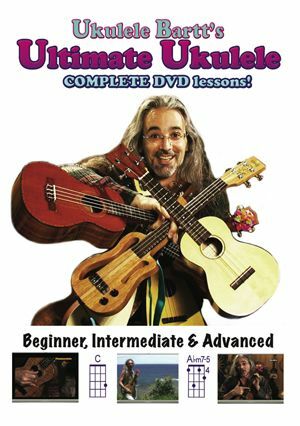 Bartt Warburton's instructional DVD download, "Ukulele Bartt's Ultimate Ukulele," is a detailed series of lessons, from beginner through advanced. Bartt is a world-recognized ukulele musician and "Teacher of the Year" in America's second-largest school district, LAUSD. He has been commended as a Teaching Treasure of Los Angeles, has been profiled on Fox 11 news, KTLA television, and Australian News TV, and has performed across America, Europe, and Oceania. He knows his stuff! This DVD download has a lot of everything, from chords to right-hand and left-hand techniques, plus Blues and Flamenco sections. You can preview it at Bartt.net. If you're looking for strictly beginner lessons, check out Bartt's "Ukulele Crazy - Get Your Uke On," produced in association with Mahalo ukuleles. Both of Bartt's instructional DVDs have companion e-books. Everything is available at Bartt.net. Lots of free downloads of songs charts, lessons, and tons of other magical uke stuff.